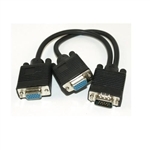 This splitter cable is for splitting VGA signal to 1 VGA and 1 DVI, and provides an inexpensive alternative to displaying an image on 2 monitors at the same time. (**)This DVI connector is DVI-A(analog). DVI-D connector is not compatible with this splitter. Please check your device before buying. This passive splitter will distribute a single analog DVI-A input to one SVGA and one DVI-A monitor outputs. The single DVI-A plug, the SVGA port, and the DVI-A port are gold plated to ensure smooth, corrosion-free connections. This passive splitter will distribute a single analog DVI-I input to two SVGA monitor outputs. The single DVI-I plug and two SVGA ports are gold plated to ensure smooth, corrosion-free connections.